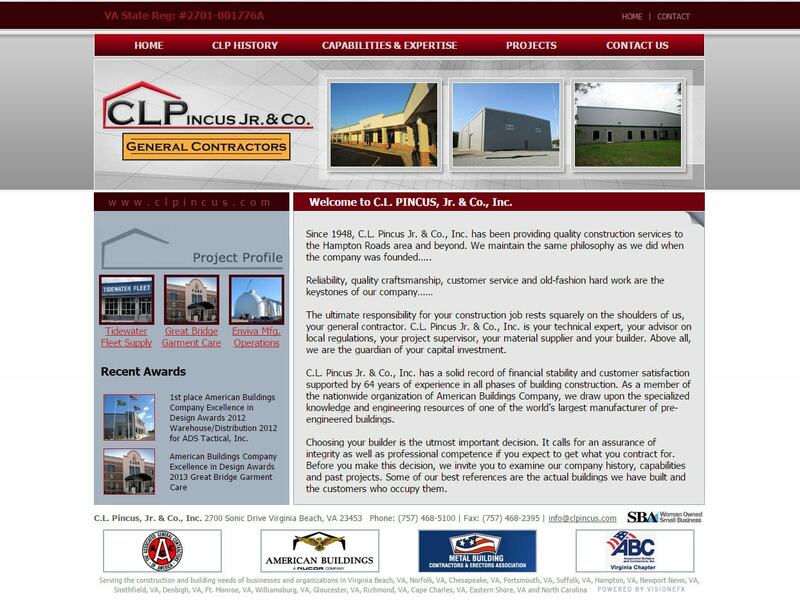 Website design for General Contractors | VISIONEFX provides web design for construction companies in Hampton Roads VA. The VISIONEFX web design team created a branded website that features a photo gallery containing historical photos for the company as well as a large photo gallery for on-going construction projects. Pincus Construction is a premier construction company located in Virginia Beach, VA. When searching Websites builders and contractors website design Va Beach look no further than the web design experts at VISIONEFX. VISIONEFX is a Web design company based in Virginia. We provide services to national companies as well as small to medium businesses throughout the United States to include; custom web design, web development, E-commerce web design, Word Press web design, Joomla web development, SEO and web maintenance services. Call: (757) 619-6456 or rick@visionefx.net.